Absolutely WONDERFUL! 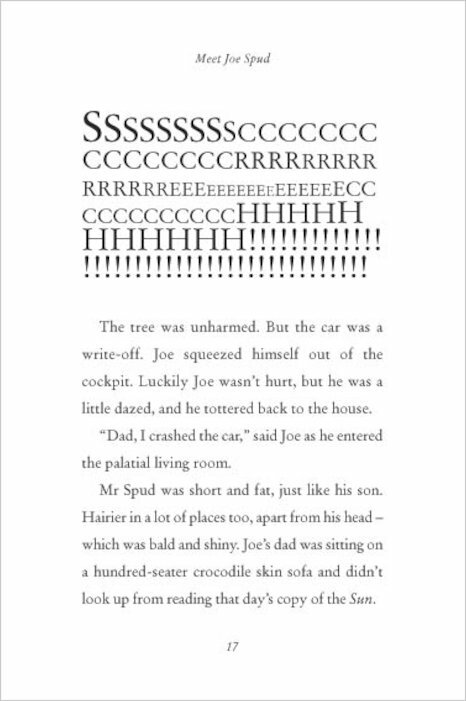 It was such a nice book because it is so funny, especially when the main character(Joe)’s dad embarrasses him at school! The moral of this story is that money can’t buy friendship. 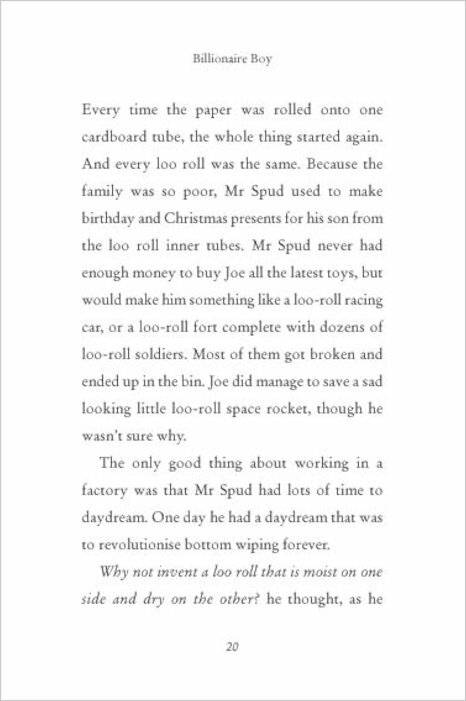 Billionaire Boy is a spectacular book about the son of a loo-roll maker who makes a lot of money by his company “Bumfresh”. I liked this book because it is a mixture of funny, sad and money isn’t everything feeling. I really hope you enjoy it! Really funny one of Walliams best novels! I loved reading this book . It was hilarious 😄 l highly recommend . 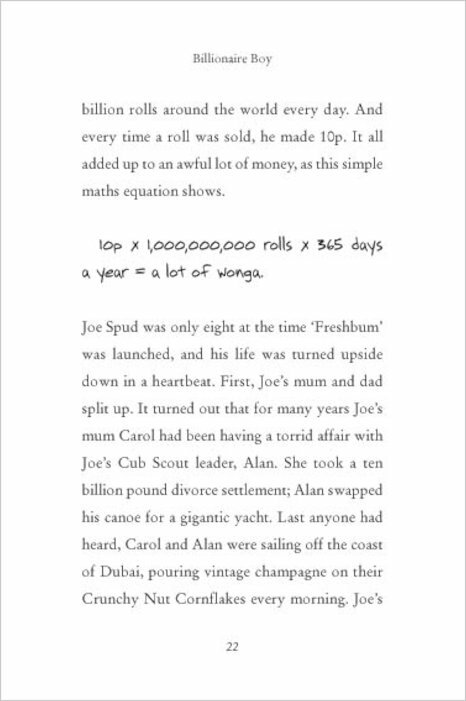 The book is about a billionaire boy! I loved it read it ready got through it quick so many amazing story’s so thanks to David walliams who is the author that wrote the book. I like his books. Got spall of them he’s very funny I think he’s got a sense of humour. Goof book,lots of lessons on how not to be as a human being. SO inspiring and funning even though i go to secondry and wear full on make up i love it!! this is the funniest book on earth but also a bit sad. I would recommend this to anyone really absolutely hilarious! all about how money cant buy you happiness. Moving and funny but sort of real. I LOVE IT!!!!!! 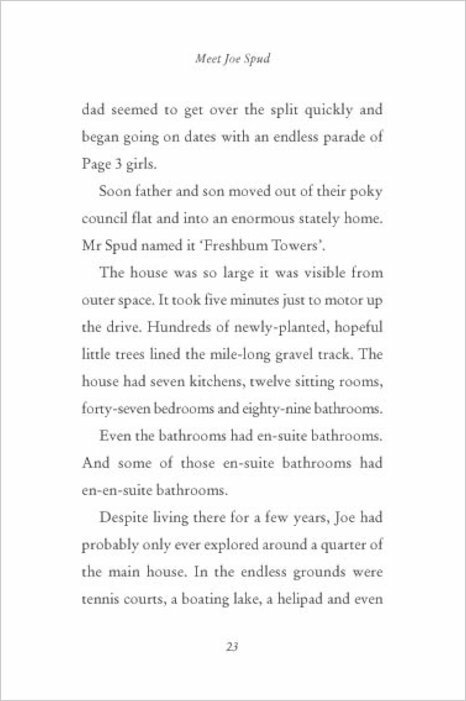 Billionaire Boy is one of the funniest books I have ever read. Not a surprise, really, because it’s from David Walliams. My favourite character is Raj, the news agent, because his ‘amazing’ deals are very humorous. 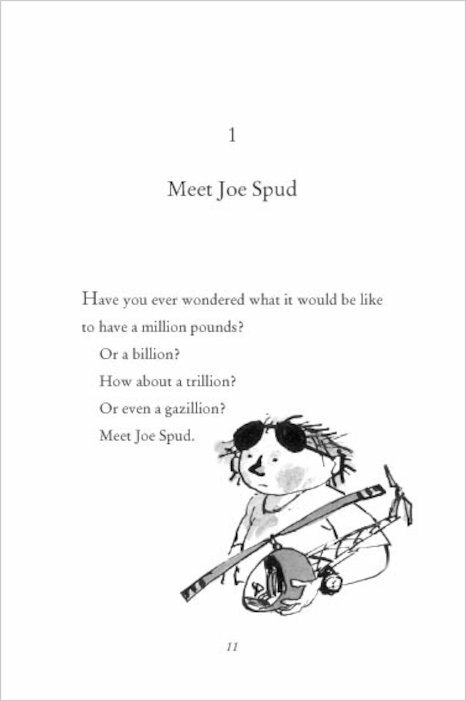 This book, like all David Walliams’ books, was really funny, but with a serious meaning behind it, like this book goes to show that money can’t buy everything. this book has a good life lesson. I got this for xmas 2013 and i loved it.It is my second favourite david walliams book,Gangsta Granny is my favourite! It was awsome and jaw dropping of how much money he had and it me=ade my imagenation come to life. 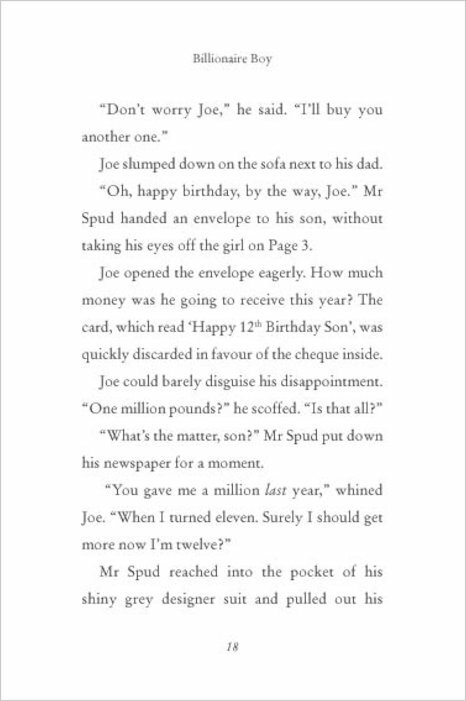 This hilarious book is about a rich boy who tries to find a friend. Theres only one word to describe this book : EPIC!!!! 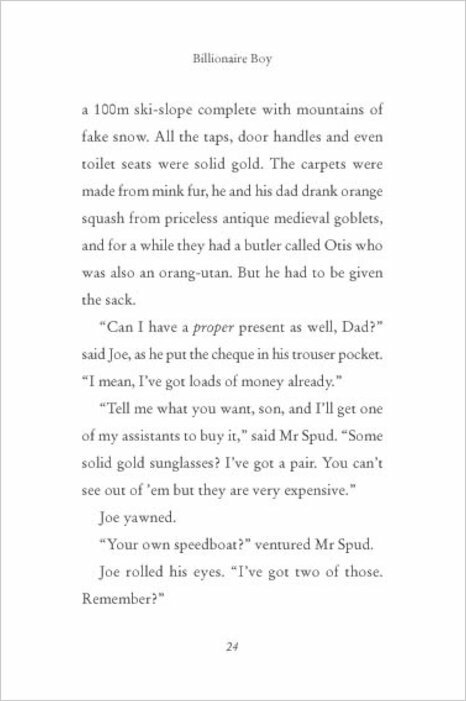 I love this book so much along with all the other books of David Walliams such as: Mr.stink Ratburger Gangsta Granny and lots more but love this book especially read it more that 4 times. I really enjoyed reading this book. 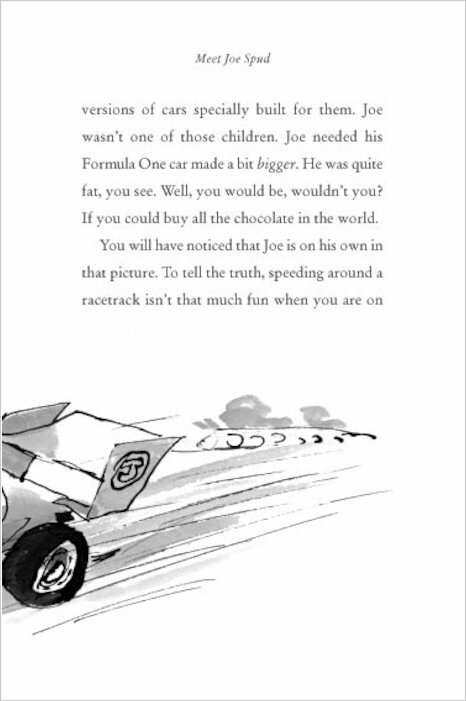 It made me think about my life and if I have ever made a mistake like Joe did. I hope that I never in my life have problems with my family and friends. I would rate this book five stars. I think this boy is very good.I personally give it a 4/5 stars. Find out more facts in this fabulous book. Loved this book! I would recommend it to anyone who would want a laugh! It was hilarious! I enjoyed it a lot. A wonderful book, great fun for reading!! 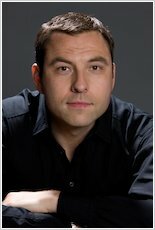 David walliams is a grey author. This is very funny and clever. Not my fav but very good. this is super funny. I couldn’t stop laughing. 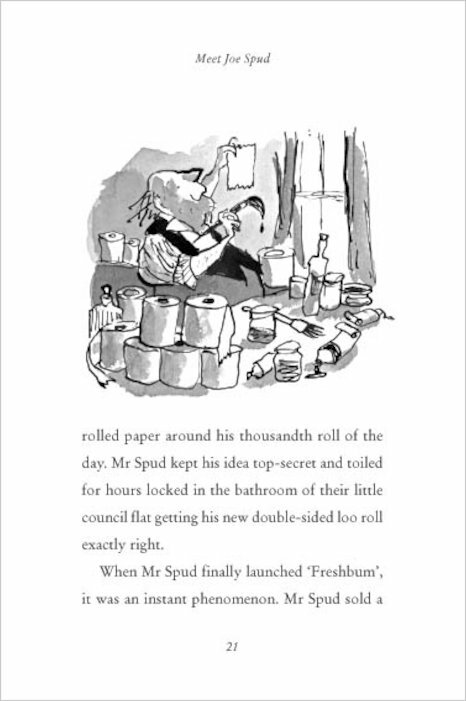 The main character in this book is Joe Spud, son of gazillionaire Len Spud, who made millions by….well, making loo roll. 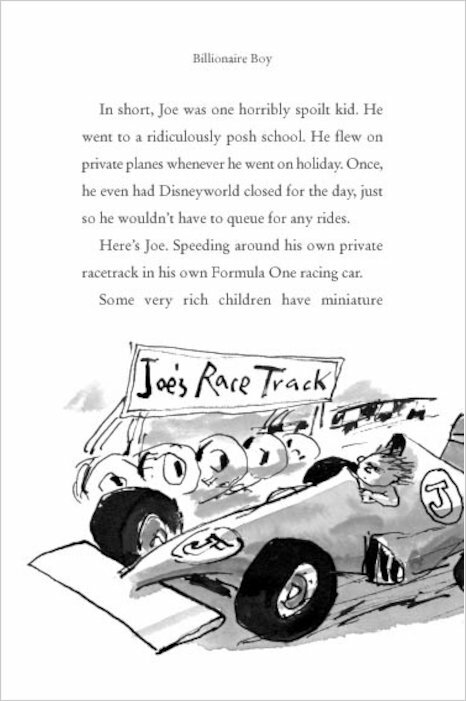 Joe is ridiculously spoilt and even has his own Formula One life-sized car and race track in his back garden, and even en-suite bathrooms that have en-suites that have en-suites! It’s not all fun and games though. Think he has everything? Nope. He just wants one simple thing; a friend. This book is hilarious and fun, yet still manages to give out the message that money just doesn’t buy you happiness. Through reading this book, you can tell David Walliams is a naturally funny person, perhaps more so through writing rather than on TV. The ideas in this book are imaginative, funny and ridiculous, which is exactly what makes the book great! Billionaire Boy is aimed at slightly younger children, but I think anyone would enjoy this! For children or even the children-at-heart. And adults who are fans of David Walliams’s TV comedies! I give this a rating of 5/5. It’s a brilliant book!! I’m reading this book from my library in my class at school and it’s reaally funny!!! I would reccomend this book to people who love a bit of laughter. I love this book so much!!! 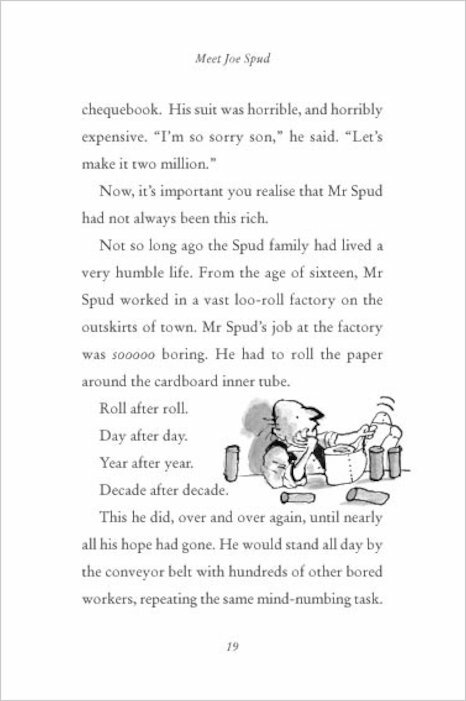 It’s funny and heart warming but it also sends a message to us all, rich or poor, it tells us that even if your rich, the money doesn’t matter, it’s whether you are happy or not and what people really think of you, for who you are. I would recommend this book to anyone!! 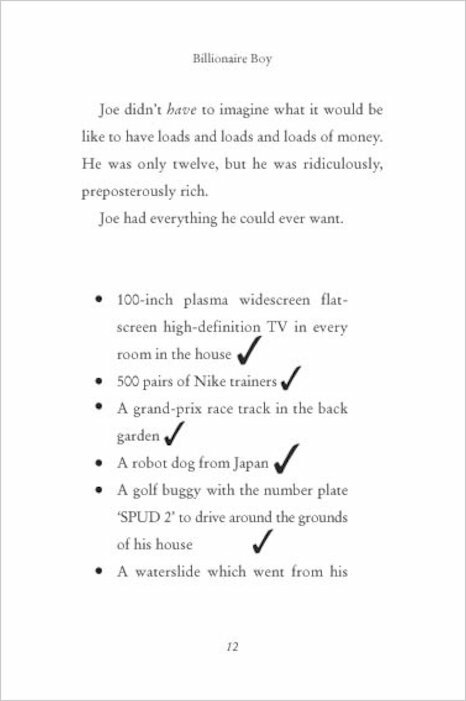 Great book in the middle of it right now, all about a boy called Joe who has everything he could ever wish for including “2” crocodiles but the only thing money cant buy is a friend! 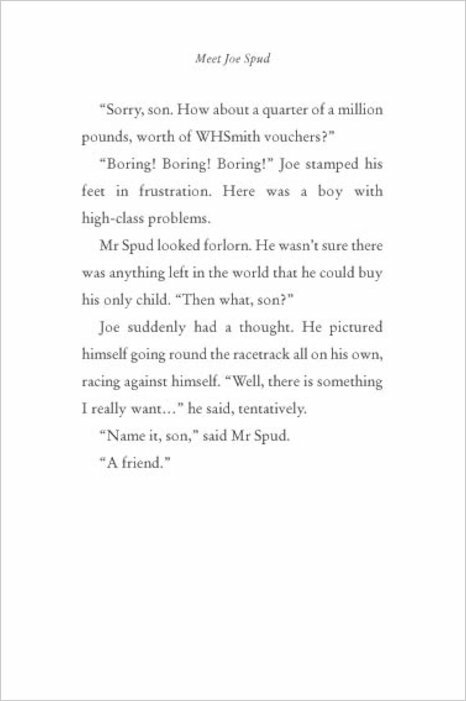 When Joe quits his POSH school he joins a ordinary school. Will he ever find a REAL friend? I think this book is amazing and hilarious and i recomend it and i would know he is one of my favourite authors. This is one of the best books ever i would reccomend it to boys or girls aged 6 – 16 !!!!!! outsanding, this book left me speechless! Where ever i look everyone is passing this around. 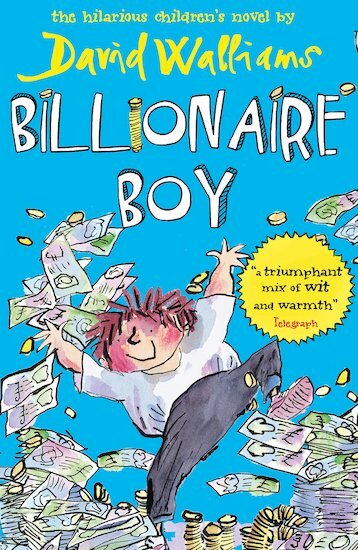 Billionare Boy is a book about a boy who is rich and lonley but then his life turns around for the better. The characters were very adventurous also the book made me laugh a lot I would definatly reccomend the book to children aged 9 – 12 for both girls and boys. I think the genre was funny because there were humourous characters. 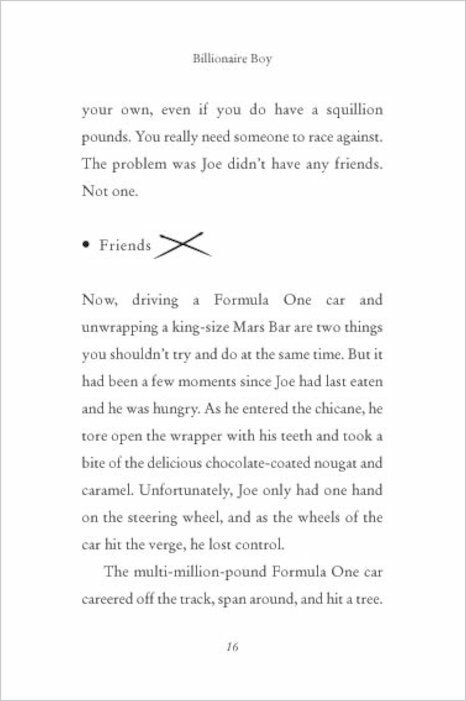 Billionaire Boy is a fast paced, exciting book. It is about, well as you can tell from the title, a boy who’s father is a billionaire. Full of comedy and schoolteachers and chocolate, this book is a great read for all ages. But don’t forget to spend your billion pound note wisely.